William McKenzie Morrison produced this cabinet card portrait of actor William Hunter Kendal (1843-1917). Morrison’s studio was housed in the Haymarket Theatre building in Chicago, Illinois. Morrison was known for being a photographer who specialized in taking photographs of celebrities. To view other portraits by Morrison, click on the category of “Photographer: Morrison”. Kendal’s given name was William Hunter Grimston and he was an English actor and manager. He was born in London and had his theatrical debut in Glasgow at age eighteen. Four years later he appeared in London at the Haymarket Theatre. In 1869 he married Madge Robertson (1848-1935) and they performed together for many years. Kendal was a co-partner in managing the St. James Theatre from 1879 through 1888. Between 1889 and 1895, Kendal and his wife toured successfully in the United States and Canada. Their American debut was in “A Scrap of Paper” (1889). The couple retired from acting in 1908. 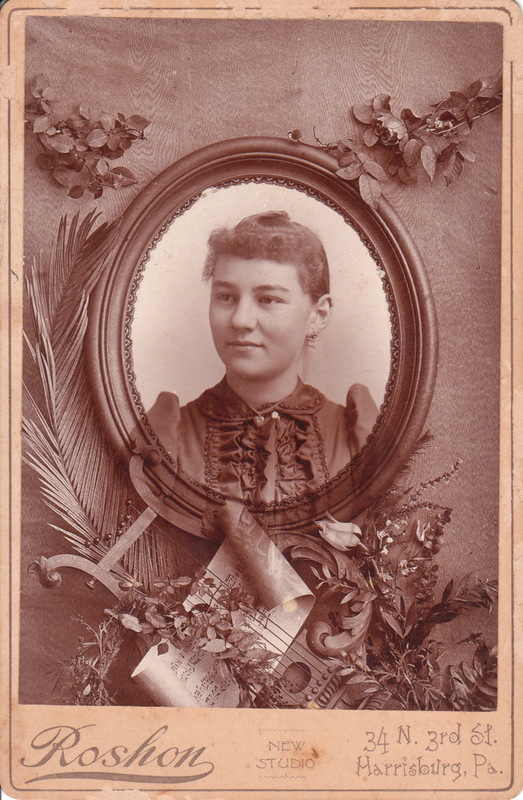 A young woman is featured in this cabinet card that appears to be a memorial photograph. The image has a musical theme. Note the pictured string instrument and the scrolled sheet music. Perhaps the young woman pictured in the frame was a musician. The photographic studio responsible for this interesting image is the C. S. Roshon studio which was located in Harrisburg, Pennsylvania. The cabinet card gallery has another Roshon photograph in its collection). 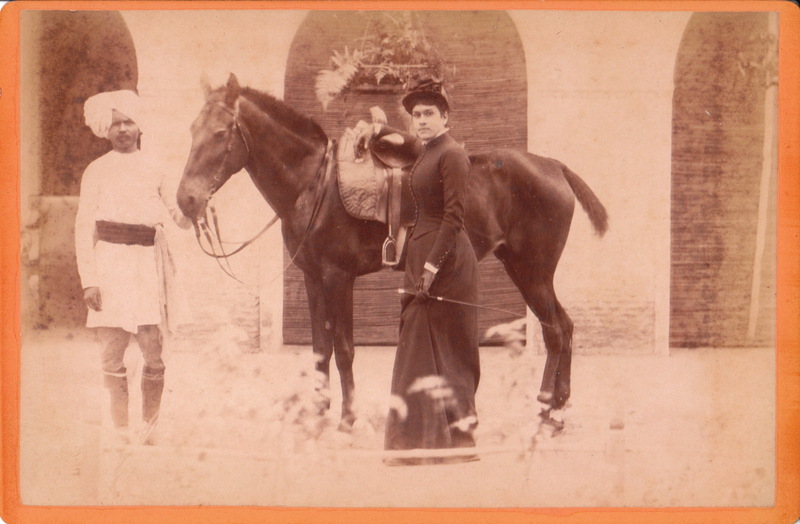 This second photograph is one of the more controversial images in the gallery’s collection because it very well may be a counterfeit cabinet card. The image features a Native American man with a turkey vulture on his head. Click on the category “Photographer: Roshon” to view this photograph. Two affectionate men pose for their portrait in Newton, Kansas. The men look quite dapper in their suits and with their straw hats. Note that the gentleman wearing the suit and vest has a pocket watch chain visible atop his vest. 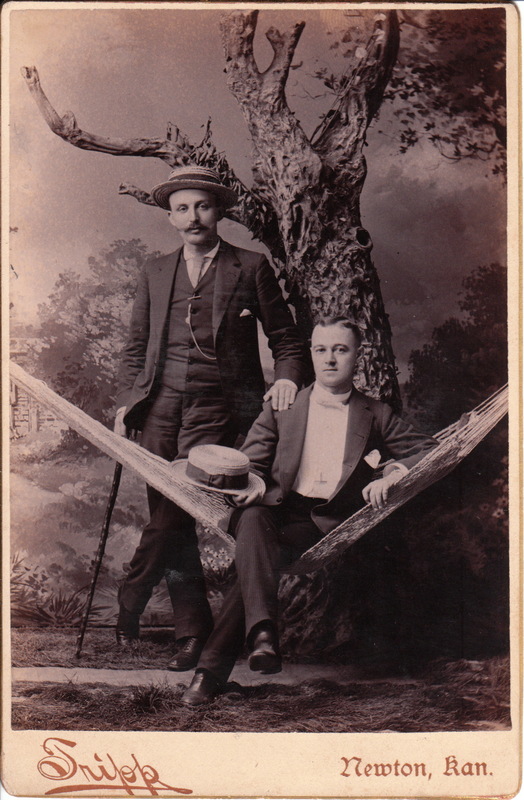 He is also holding a walking stick.The man standing, and the man sitting on the hammock are showing some shared affection. They could be friends, relatives, or even lovers. It is impossible to guess their relationship. One wonders if homophobia was much of a factor in the cabinet card era in regard to men showing affection to men in public or in photographs. Perhaps a visitor to the cabinet card gallery can competently comment on this issue. The photographer of this image is the Tripp studio in Newton, Kansas. According to print on the reverse of the photograph, the studio was located on the corner of Main Street and Broadway. The photographer, Frank D. Tripp is cited in Anthony’s Photographic Bulletin (1896) as the President of the Photographers Association of Kansas. Another source states that Tripp “flourished” as a photographer in Newton during the 1880’s. Tripp’s obituary appears in The Evening Kansan Republican (1947). He died in Denver, Colorado at age eighty. He was described in the article as a pioneer photographer in Newton. He was an officer in the Newton Masonic Lodge. At some point he moved to Pueblo, Colorado where he was a partner in the Tripp and York photography studio. 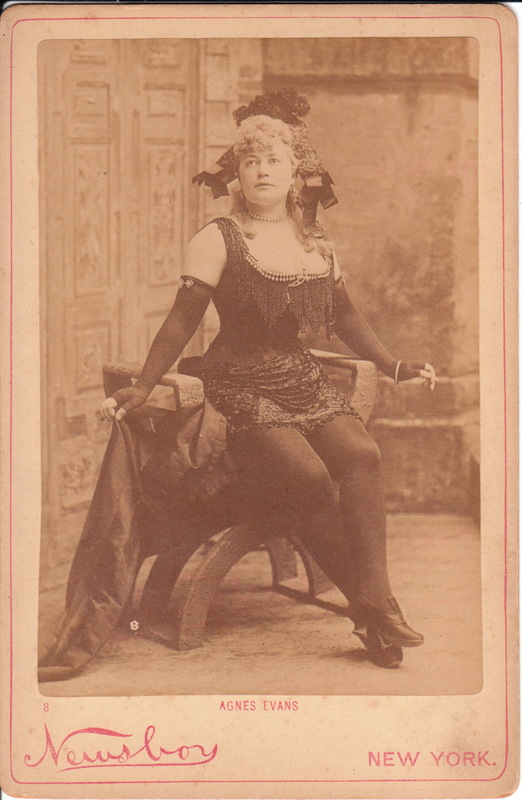 Agnes Evans poses for this cabinet card (top) photographed by Newsboy of New York. 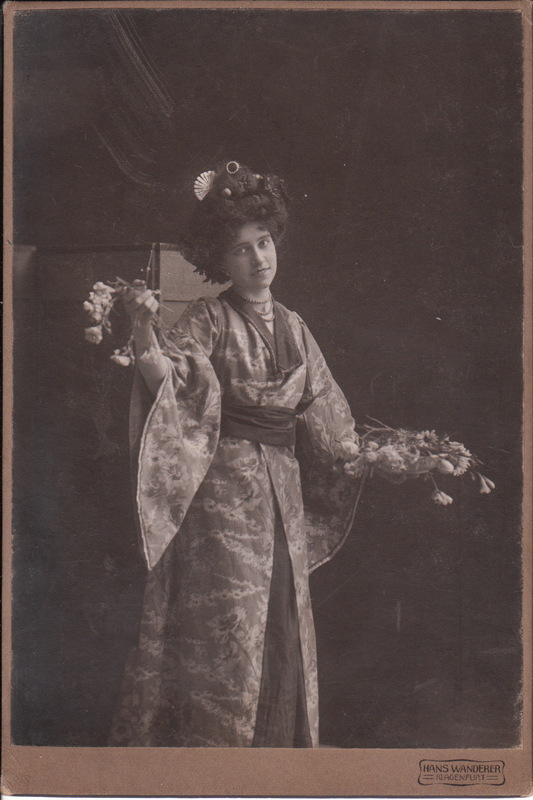 Agnes Evans was a theatre actress who performed in the Broadway production of the Pit (1904). The actress is wearing a very revealing risque dress. Further research by myself or assistance from visitors to this site will hopefully further illuminate her life and career. Newsboy was a brand of plug tobacco and Newsboy photographs were given away as a premium by tobacconists and drug stores who sold the tobacco. The images were produced by the National Tobacco Works of New York. They were likely produced and issued in the early 1890’s. The bottom image features Miss Evans in another Newsboy cabinet card (number 8 in a series). She is wearing a risque costume that includes fingerless gloves. George Hadley of the Castle Studio produced this portrait of a woman in deep concentration. She is studying what appears to be a small framed photograph. One of her hands rests on a table. The table top holds an inkwell. 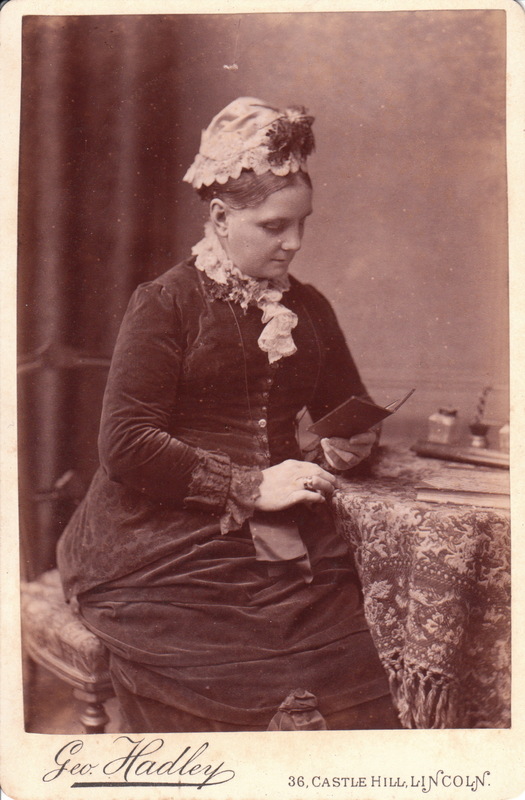 Printing on the reverse of the cabinet card indicates that the studio had won prizes at exhibitions at Cornwall (1884), London (1884), and Northampton (1884). The studio was located in Lincoln. Lincoln is a cathedral city and county town of Lincolnshire, England. 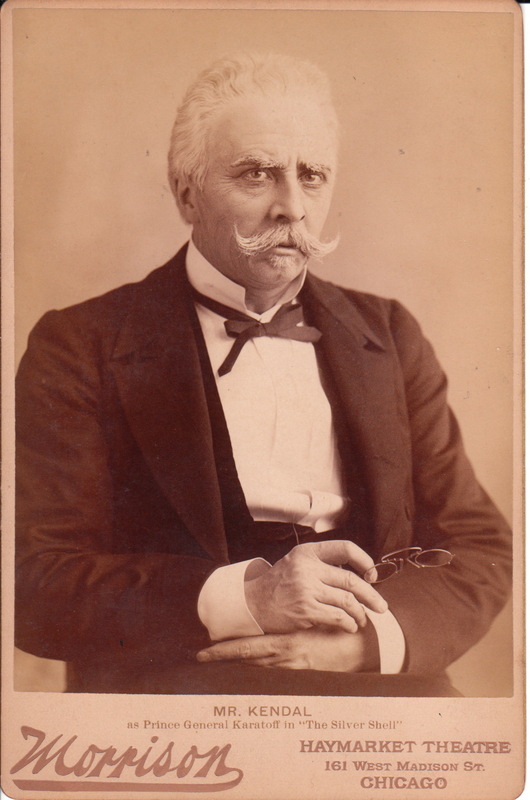 Johnston Forbes-Robertson (1853-1937) was a celebrated English actor and theater manager. He was considered to be one of the finest actors of his time. He was particularly noted for his portrayal of Hamlet. He did not profess a passion for his acting profession. He was born in London. His father was a journalist and theater critic. He had ten siblings and four of them pursued acting. His original interest was to become an artist, but to support himself financially he entered acting. He worked with Sir Henry Irving for some time as a second lead actor. He then became a lead actor. His starring roles included Dan’l Druce, Blacksmith and The Parvenu (1882). George Bernard Shaw wrote the part of Caesar for him in Caesar and Cleopatra. 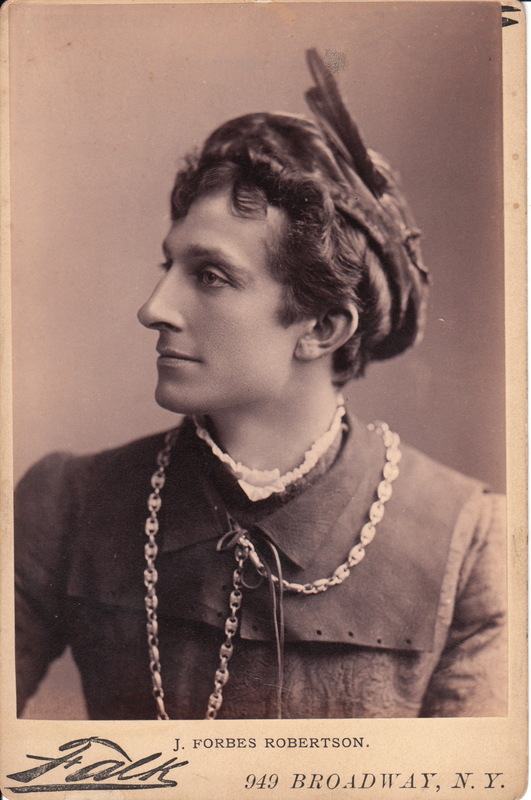 Forbes Robertson acted in a number of Shakespeare plays and also appeared a number of times with actress Mary Anderson in the 1880’s. In 1900 he married the American actress, Gertrude Elliott (1874-1950). In 1930, Forbes Robertson was knighted. 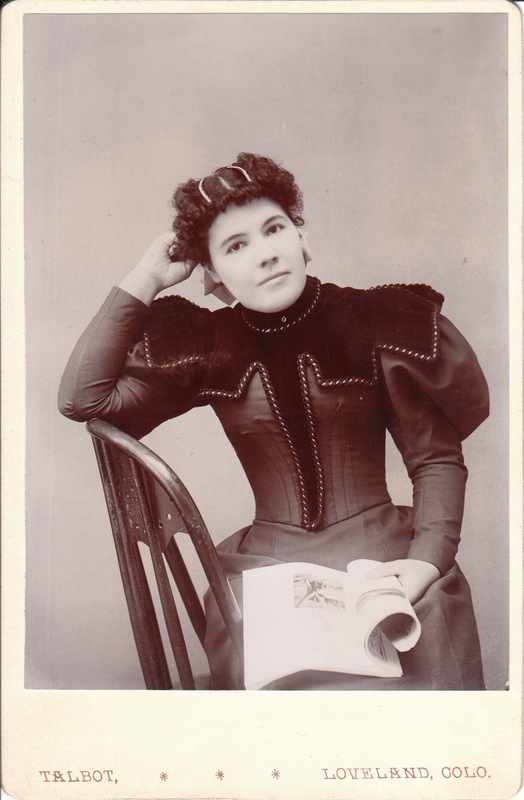 This cabinet card portrait was produced by photographer Benjamin Falk who’s studio was located in New York City. Forbes Robertson is captured in costume in this image. The reverse of the photo is stamped “J. M. Russell 126 Tremont Street, Boston”. 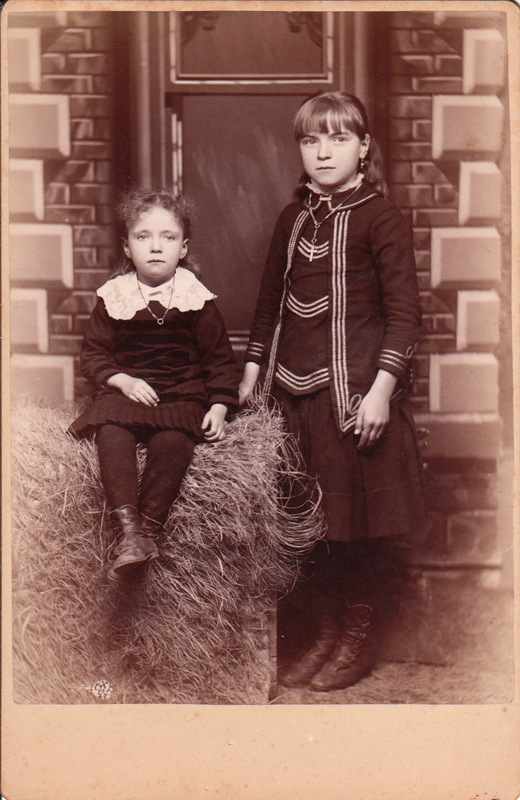 The two young girls in this cabinet card portrait are probably sisters. They are posing with a bale of hay in front of a fake brick house. Both girls are wearing necklaces and the older girl is displaying some religiosity by wearing a cross. The photographer and the location of the photographer’s studio are unknown.